In the late 19th century, there was a desire for self education. In many parts of the coalfield, there were literary and debating societies, scientific societies and mechanics’ institutes. The Chapels and coal owners encouraged these societies as they believed they kept men from being involved in trade unions, away from public houses, and encouraged them to become respectable. There were also evening classes, such as first aid classes, organised by the local authorities, In the early 20th century, the Workers Educational Association and Extra-mural classes at Cardiff and Aberystwyth universities proved to be very popular. Many miners felt though, that this education was organised to keep them in their place in society. This led to the formation of the Independent Working Class Education Movement in the early 1900s. It was designed to educate men in trade union and political work, with the classes organised by The Fed and the Plebs League. The movement was important as it produced a new generation of trade union leaders and MPs such as Aneurin Bevan. At the same time, many villages and towns in the coalfield had Miners’ Halls and Institutes, in which adult classes were held. Many of these institutes had libraries, as there were no public libraries in the valleys until the 1920s. By the 1930s, there were over 100 miners’ institutes in the South Wales coalfield. Built and maintained by the miners, paid for with weekly deductions from their pay packets, the miners’ institutes were the location for many adult education classes in the South Wales Coalfield. Most institutes had a library or reading room. The libraries and reading rooms, being financed and run by the miners, naturally exerted a great deal of influence on the community they served. 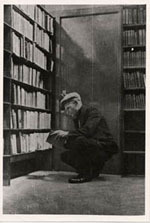 The bookstock and journals held reflected the interests of the local community, and usually contained a wide selection of both serious and light reading. Miners’ Institutes and their Libraries had an enormous cultural and educational influence on communities throughout the South Wales coalfield. The libraries have been described as the ‘brains of the coalfield’. Will Paynter, once National Secretary of the NUM, who frequented Cymmer Collieries Workmen’s Library in the 1920s, described it as his ‘Eton and Cambridge’. Burge, Alun, Davies, Keith, Francis, Hywel. Enlightenment of the Highest Order; the education programme of the South Wales Miners. (DACE, Swansea, 1996). Davies, D. Llewelyn. A history of Cwmaman Institute. (Mountain Ash, 1982). Evans, D. Gareth. A History of Wales, 1815-1906. (Cardiff, 1989). Francis, Hywel. Do miners` read Dickens? Communities, Universities and a new beginning. (University of Wales Press, Swansea, 1994). Francis, Hywel. (ed). Adult education in the valleys: the last fifty years. (Llafur, 1986). Hoare, George. The History of Oakdale Institute 1912-1946. Lewis, Richard. Leaders and teachers: adult education and the challenge of Labour in South Wales 1906-1940. (Cardiff, 1993).